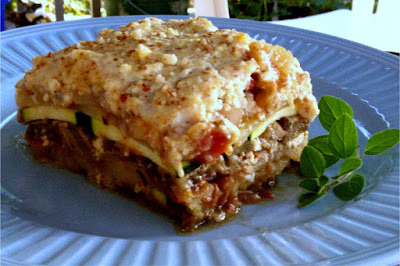 Feta Cheese, Parmesan, an eggy, creamy bechamel sauce and, of coarse, fresh eggplant and zucchini; these were the cornerstones of my favorite Moussaka. It's a little non-vegan, though, and a little on the fatty side. I've wanted to recreate this for a while and finally had cause to do so. Recently, I've had a couple of breakthroughs that lead me to revisit this dish. First, I stumbled upon a fake feta in the Uncheese Cookbook that I had to try. I made a batch, used some in a spinach/kalamata calzone and had lots left over. Second, I'd been playing with ground flax and was wondering if I could make a custard-like bechamel with flax. This vegan moussaka is firm and flavorful, not at all greasy, and adds a nutty flavor. The flax made the sauce more creamy than custard-like and flavored the sauce in a very positive way. The tofu feta has a flavor and texture similar to real feta. The tomato/lentil sauce is subtle and not at all overpowering. The eggplant is a predominant flavor. Please note, though, this moussaka is an endeavor. The 'feta' marinades for, at least, a couple days. You'll spend an hour chopping and baking veggies, and it'll bake in the oven for another hour. Moussaka takes some work and planning, but it is well worth it for a treat or special occasion. VEGETABLES: Preheat oven to 400 degrees. Slice the eggplant and sprinkle both sides liberally with salt and leave in a colander or propped baking sheet. Allow to drain for 20-30 minutes. Spray a baking sheet with cooking spray. Spread potatoes evenly on the sheet and bake for about 30 minutes, until slightly browned, turning once. Slice the zucchini and set aside. Thoroughly rinse the eggplant slices, pat dry and bake in the same way as the potatoes, for about 30 minutes. The zucchini need not be cooked, so long as it is sliced very thin, around 1/8 inch. If you like thicker zucchini slices, bake the slices until they begin to soften. I don't like soft zucchini, so I don't precook them. SAUCE: Saute the onions, adding garlic just before done. Cook until fragrant and add the vinegar and let reduce. Add the tomatoes, including juices and 1/2 can of lentils (and ½ of the juices), and the oregano, parsley and cinnamon. Let simmer for about 15 minutes and set aside. BECHAMEL: Melt the margarine and stir in the flour, stirring out the lumps. Remove from heat and add the milk. Return to heat and cook the sauce until it thickens. Set a side and let cool slightly. Stir in ground flax seed. TO ASSEMBLE: Layer the eggplant in a 9 x 13 casserole. Add the Potatoes and zucchini. Pour the tomato/onion sauce evenly over the potatoes, then spread the crumbled feta. Repeat with eggplant, potatoes, zucchini, tomato/onion and feta. Pour the bechamel over the top and sprinkle with parmesan the ground almonds. Cover and bake at 350° for 1 hour. Remove the cover for the last 15 minutes. Cube tofu into 1" cubes. Submerge in boiling water and simmer for about 5 minutes. Drain. Whisk together the water, miso, vinegar and salt. Put cubes into a marinade container and pour marinade over the tofu. Stir gently and refrigerate. Leave to marinate in the refrigerator for at least 2 days or up to 1 week. Shake the container periodically until used. To use, remove from the marinade and crumble each cube with your fingers and use in place of feta. Use within 2 weeks. Wow! Feta is one of the few things I really miss since going vegan. This recipe sounds like it would be well worth the time and patience... thank you for posting this. Adding you to my blogroll, btw. The Feta was good. I've tried a couple things from the Uncheese Cookbook that I think have potential. I made grilled cheez sandwiches on Sunday that were ok, but have some consistency issues. Nice blog, Veggie Guy. I'll be paying attention. Sounds like alot of work, but it looks like it's worth it. why is their Parmesan on the recipe instructions? So long ago... I'm guessing it was a cut and paste error from my original, non-vegan recipe. Your link may have been the original (I am vyapti). Thanks for pointing it out, I fixed the error.